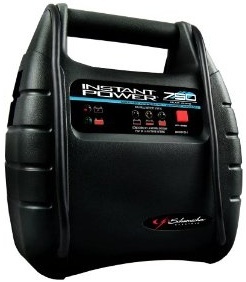 If your car battery can't start the engine, the best is to recharge the battery with an external car battery charger. 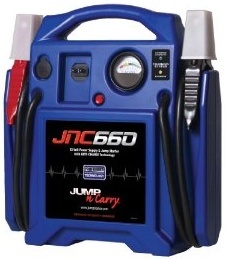 In case of emergency you can try to jump start the auto battery with a car battery booster or with another car. But remember that if done incorrectly, jumping a dead car battery can be dangerous and financially risky. WARNING: Do not jump start a frozen battery. If below freezing, ensure that the electrolyte is not frozen in the dead car battery. If frozen, do not jump or boost the 12V car battery until the battery has been fully thawed out. The electrolyte in a dead lead-acid car battery will freeze at approximately 20°F (-6.7°C). The freezing point of a battery is determined by the state of charge. With state of charge 25% the freezing point is 5°F (-15°C). Check that your car battery booster is fully charged. Put your booster on the ground in front of the car. Wear protection goggles and gloves. Turn off ignition and all accessories (radio, lights etc.) on the car. Connect the red clamp from the car battery booster to the positive terminal of the battery. Connect the blue clamp from the car battery booster to a clean, unpainted metallic area in the engine block not too close to the battery. Start the vehicle's engine. Don't try to start the engine for more than 10 seconds. If it can't start, disconnect the booster and wait 3 minutes before the second attempt. Disconnect the blue clamp first, red - second. Recharge your car battery booster. Turn off all accessories, heaters and lights on both vehicles, especially electronic appliances, such as a radio or audio system and ensure there is plenty of battery ventilation. Start the car with the good battery and let it run for at least two or three minutes at medium RPM to recharge its battery. Connect the positive (+) dead battery terminal to the positive (+) good starting battery terminal with the red booster cable. Connect the one black booster cable clamp to the negative (-) terminal on the good battery. Connect the other black booster cable clamp to a clean, unpainted metallic area on the engine block or frame on the disabled vehicle and at least 10 to 12 inches (25 to 30 cm) away from the battery. This arrangement is used because some sparking will occur and you want to keep sparks as far away from the battery as practical in order to prevent a battery explosion. Let the good vehicle continue to run at medium RPM for five minutes or more to allow the dead battery to receive some recharge, to warm its electrolyte, and reduce the load of the dead battery. Start the disabled vehicle and allow it to run. If the vehicle does not start the first time, wait a few minutes and try again. Disconnect the negative (-) clamp on the engine block or frame of the disabled vehicle first. Then disconnect the other clamp of the black cable. Allow the engine on the disabled car to run until the engine come to full operating temperature before driving and continue to run until you reach your final destination, because stopping the engine might require another jump start. Also, keep all unnecessary electrical accessories off to relieve the load on the charging system and allow it to add charge to the battery. 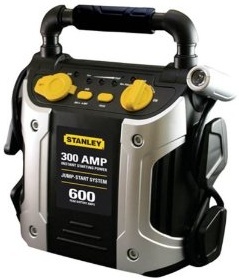 As soon as possible and at room temperature, fully recharge the dead battery with an external car battery charger. 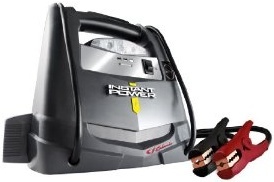 Jump start a car battery with another car only as a last resort. Using a car battery booster is safer.